We build the wealth, bringing the Top International brands, relations for better tomorrow today! Our journey and success is base on WIN/WIN philosophy. All participants must WIN! We are enthusiastic developers, consultants who successfully collaborate with investors, clients, users and the government. We see cooperation as a long term continuing mutually beneficial strong partnership. 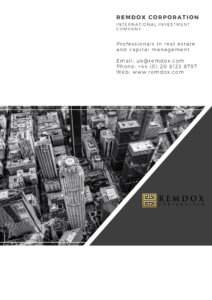 Creativity and innovation is the fundamental aspect of continuing the growth of REMDOX Real Estate companies. We create it, we do the concept, we help achieve success and create wealth for our clients. We are reliable and responsible. This we expecting from our present and future partners. We are transparent and all what we do combine with business acumen, soundness and durability. We create the environment for long term satisfaction for users, visitors, residents, investors, for all where we actually care about. For our investors , the long term satisfaction of end users and market our financial products means a sustainable ROI Return on their investments. Sustainability is for us in REMDOX the long-term maintenance of our responsibility, which has environmental, economic, and social dimensions. It is important constant quality in all what we do for you.